Happy and healthy year of the Pig! kāituò 开拓 / 開拓 can mean "develop (border regions); break new ground; open up (new horizons); extend; expand; exploit"
Many more photographs of the pictured event may be found in this Chinese article. "exploration" was clearly the word the translator had in mind, not "exploitation"—what a difference three letters can make. I have some personal experience with Freudian slips. As a first-year assistant professor, I once wrote a fellowship application mentioning, perhaps three times, "ineffectuals" when the intended word was "intellectuals." Fortunately, the department chair, who'd once been a proofreader at CBS, caught it in time. I was going to comment that "exploitation" might just have been a case of picking a word with the wrong connotation. "Development", for example, has neutral-to-positive connotations and might describe the same realities (e.g. natural-resource extraction). But not knowing Mandarin, I'll defer to jin defang above. I think it's fair to say that there is a neutral sense of "exploitation" but it's usually heard more in scientific/technical circles. In French the word is much more often neutral. However in any context directly involving international relations, the much more loaded sense is more obvious. I don't think that 'exploration' is the word the translator had in mind. As the OP pointed out, 开拓 has the sense of 'open up', 'develop' (as in new areas, frontiers), 'exploit' (as in resources). While 'exploit' still has the sense of extracting value from the natural environment in English, it also has the less positive sense of extracting value from human beings. 开拓 is a term related to (and probably imported from) the West in an era when concepts of 'development' and 'progress' were unquestioned, although there has been a backlash in more recent times. 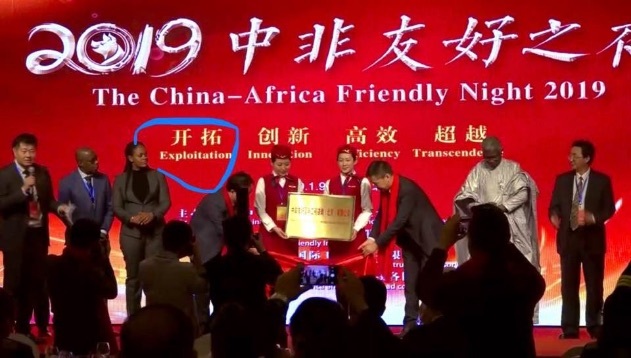 It is interesting that China is still a proponent of such values in its Belt and Road initiative and in Africa at a time when the focus in the West seems to be on unlocking value from the aggregation of individual data. The 'exploitation' of resources was a very common and positive idea back in the first half of the 20th century, and the latter half of the 19th. I have many books that can attest to it. French is an official language in many African countries; the word "exploitation" in French doesn't have such negative connotations, and generally means "making use of", "operating", or "running". I'd say exploitation is negative when referring to exploiting people, but neutral when exploiting inanimate objects. Unfortunately, most extended and figurative usages of the word have been derived from the former, to the point where seeing it without explicit context raises the negative meaning. Manipulation, exploitation, and employment are all basically synonyms when you're talking about a person using a thing. But when it's a person using a person, two of them sound bad and one of them sounds good. I would say 'exploitation' is somewhat negative when talking about a thing, also – because if you mean it positively there are many other words to choose from. The word 'exploitation' would normally come to mind when one wants to criticise its use, as in complaining about exploitation of natural resources, etc. And yes, it may not have that connotation in French, but this was clearly English and it probably wasn't written by a French-speaking African. Well yes, but we were discussing the linguistic value of the phrase, not the factual matter of China's relation to poorer countries. If we want to do that, though, I'll add my comment that the Western world goes too far the other way – and thereby fails to recognise how natural such 'exploitation' is. As an example, IIRC, "operating system" is called "systeme d'exploitation" in French.